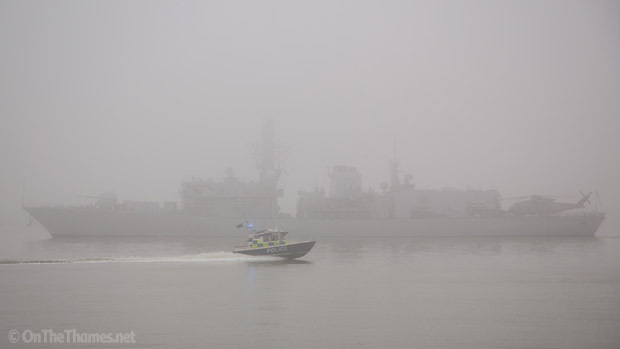 HMS ST ALBANS cruised in to London last week on a foggy Wednesday afternoon. Barely visible behind a thick blanket of fog, she arrived on the river carrying her Merlin Mk2 helicopter on the flight deck and transited under Tower Bridge at 5pm. Speaking to OnTheThames.net from the bridge of the ship, Commander Jordan described the visit to London as a "fantastic opportunity." 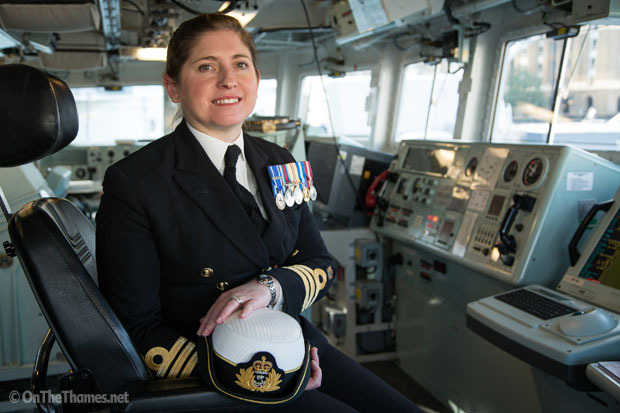 "I was saying to my young officers that they've been incredibly lucky to have this within a few years of joining when I've had to wait twenty-one years before I could bring a ship up the river!" The fog notwithstanding, what was Commander Jordan looking out for on the way in to London? "The Thames Barrier is of course iconic but I was quite focused because obviously I've got to drive us through it. 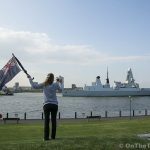 After that we saw the Millennium Dome followed by the Greenwich Naval College which of course strikes a chord with everybody on board." The Saint recently had a substantial refit. What work was undertaken? 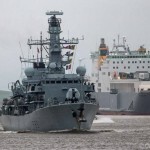 "The ship's had £25million spent on her to bring her up to a modern, relevant and most technologically frigate. 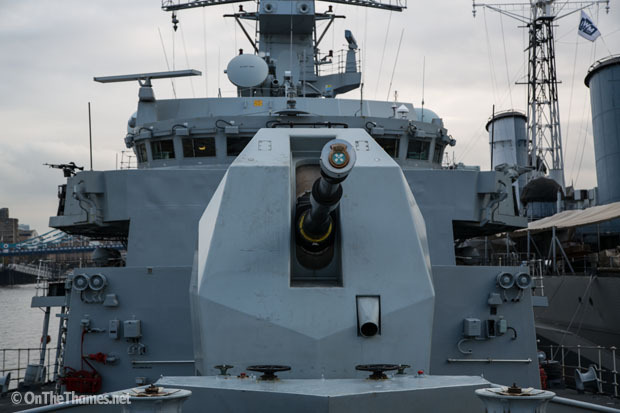 We've had a new gun put on the front which has improved ammunition for extended range and accuracy. We've had our whole combat system upgraded and the Sea Wolf missile has had a mid-life update as well to make sure we stay on that front edge of technological development." 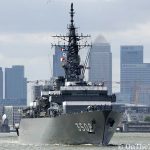 What next for HMS St Albans? 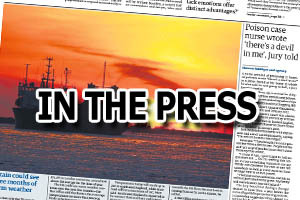 "The ship will deploy next September and until then have more stages of what we call regeneration which means more training, more weapons firings and more specialist anti-submarine warfare training. We have to pass each hurdle which takes quite a long time before we're then ready to leave northern European waters next year." 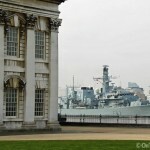 Ship navigator Lt Andrew House was tasked with getting the Type-23 frigate in to London on time. "Obviously we're used to operating in a variety of harbours and rivers around the world. 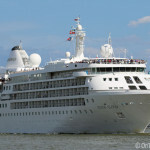 The Thames has quite a big tidal range so my job is to ensure I make my predictions correctly and know how much safe water we have because obviously the ship draws quite a lot of water with our bow dome so I need to be spot on with my maths to tell the captain when we're safe to come alongside. 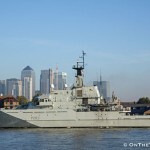 It's a long seven hours from the lower estuary to Tower Bridge but well worth it." "With AIS, vessels obviously transmit their location, their name, where they're going and what they're doing et cetera. We, as a warship, have the ability to either transmit or not transmit. We're not obliged to by law so if we're coming in and out of the Thames, want to make sure everyone knows we're coming and we'll transmit. If we're doing operations, be it the middle east, the Falklands or anywhere else in the world we'd probably have what we call a covert posture." 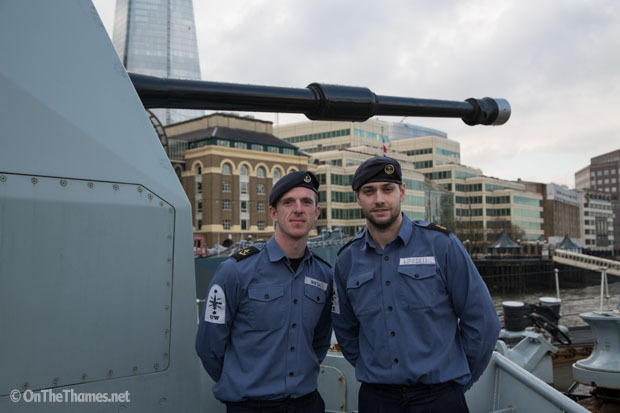 For Londoners Andrew Wardell and David Gray, coming in to the city was an especially proud moment. "It's one of the biggest highlights of my career in particular," says Wardell. "I've been putting a lot of effort in to helping the ship's company integrate in to London by being the liaison. This was one of the stops I hadn't done so it's a tick in the box, definitely." Gray adds, "It's fantastic. I had my dad and my whole family here to see it. When we came alongside they were all on the Belfast and for me, you don't get that often. To be that close and in your home town, it was amazing." 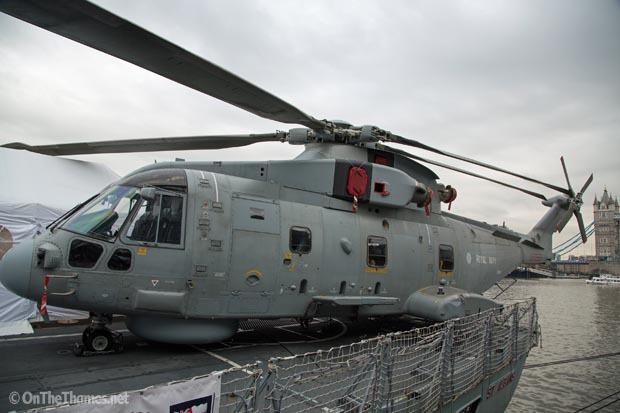 The ship carries on her flight deck a Merlin Mk2 helicopter. 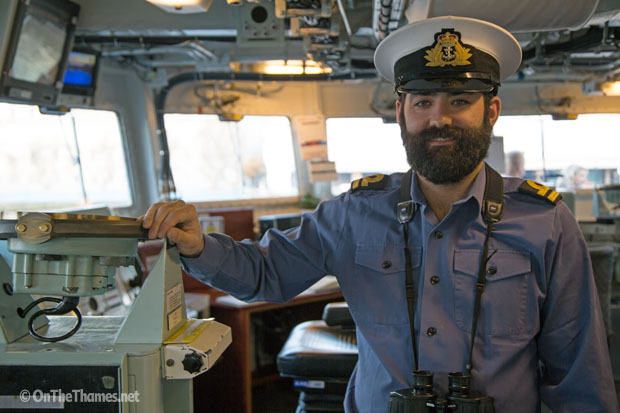 "Our role is to locate, and possibly destroy, submarines," explains pilot Rich Knight. 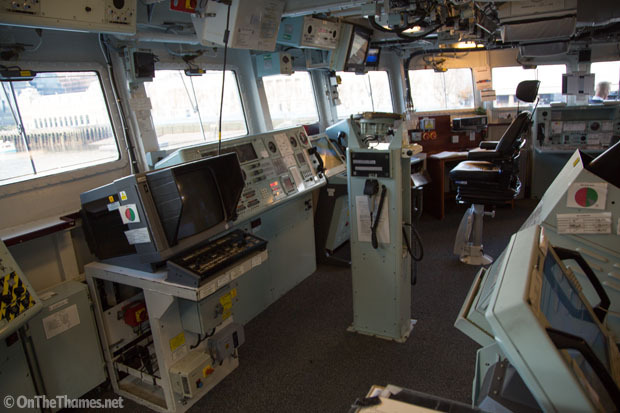 "We work really well with the Type-23s and as a very potent pair we can do all sorts of other things. We can do surface search, we can do patrolling, we can do border operations, search and rescue and lots more." Aircrewman Richie Harker explains a little about the Mk2. "Merlin came in to service in to 2000. We've just gone through a major update package and taken deliveries of the Mk2s. To the naked eye, it doesn't actually look that different but it's on the inside where the real difference is. Our mission equipment and flight system have been upgraded and it's a much more capable system than the Mk1." 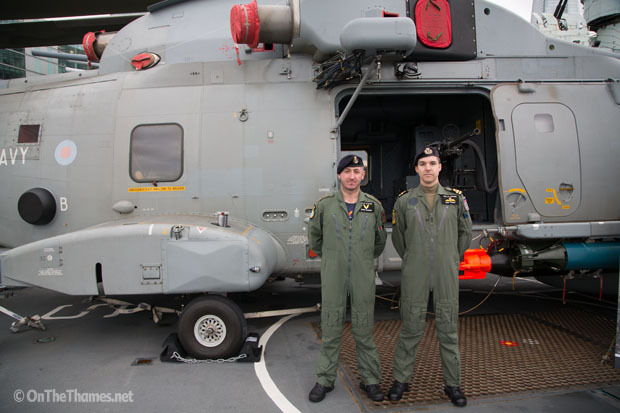 Aircrewman Richie Harker and pilot Rich Knight. 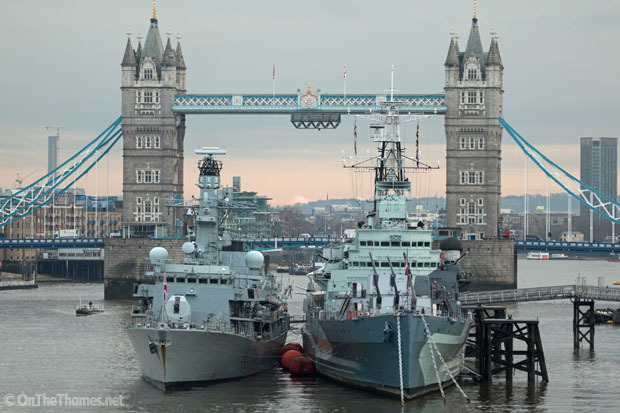 Following her stay in London, HMS ST ALBANS departs the capital on Tuesday 2nd December, passing under Tower Bridge at 10am.